In the immediate aftermath of the tragic mass shooting in New Zealand, in which a white supremacist killed at least 50 people at a mosque, Trump held a press conference to issue a veto of the bipartisan measure rejecting his illegal money grab for a border wall. 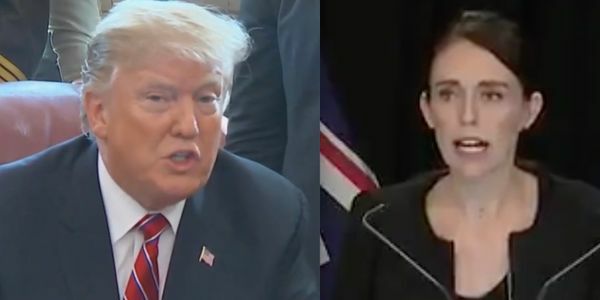 Trump tepidly fulfilled his bare minimum obligation to condemn the attack by meandering through prepared remarks before quickly pivoting to his veto, decrying an "invasion" of immigrants on the southern border — the exact same word used by the New Zealand shooter whom the president "condemned" only moments before. According to his manifesto, the shooter wrote, "we are experiencing an invasion on a level never seen before in history." For Trump to employ the same word to describe immigration, at that moment, was not only woefully inappropriate but a testament to, at the very least, just how unconcerned he is with the problem of violent white supremacists. Indeed, when asked point-blank if he believes white supremacy is a problem, Trump responded, "I don't really. I think it's a small group of people that have very, very serious problems. It's certainly a terrible thing." The fact is, however, that a staggering 73 percent of terrorist attacks in 2018 were perpetrated by far-right extremists. Trump may be content burying his head in the sand since those people support him, but the truth is clear as day. We, the undersigned, demand Trump issue a genuine condemnation of white supremacists in the wake of this most recent mass shooting. His ineffectiveness on this front has only served as tacit approval for others looking to carry out attacks in the name of white supremacy, and we demand he reverse course before the next avoidable tragedy.